We’ve got a few more weeks of prime citrus season. We’ve already made lemon curd, salted lemons and citrus cleaning spray. It’s party time. Let’s make limoncello! A traditional southern Italian digestif, limoncello is usually served ice cold from tiny little glasses. Traditional limoncello often manages to be both too bitter and too sweet for my taste. But when I first learned how to make a limoncello that is the essence of lemon – simple, pure, and clean – and opted to skip a super heavy dose of added sugar – I found an infusion I could love. In this variation of limoncello, the lemons are hung in a sling over the alcohol to extract the pungent lemon oils into the alcohol for a pure lemon flavor without tartness, and just enough lemon simple syrup is added to round out the flavor. I’ll admit that this technique is a bit rococo, but the whole sling contraption allows for a very gentle infusion. The alcohol volatilizes, penetrates the peel and drips back down, heavy with lemon oil. The closed jar creates something like a slow motion citrus oil pump, and the result is a bright, clean flavor. 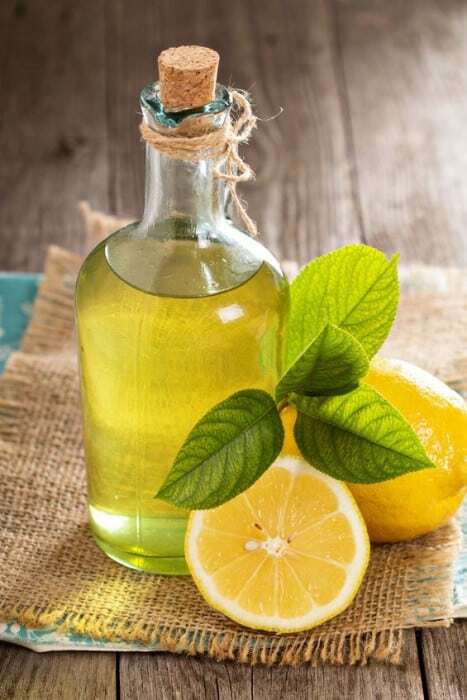 Use well-scrubbed, organic lemons for this preparation, since the vodka will act as a solvent, pulling any residual pesticides or waxes from the peel, and no one wants their limoncello with a waxy pesticide chaser. Clean and sanitize a large jar with a wide but airtight lid. I use a 5-liter Italian glass jar with a bail-clamp glass lid and rubber gasket. Similar jars are available in most houseware stores. A half-gallon mason jar should work too. Pour the entire bottle of vodka into the jar. Scrub and dry the four lemons. 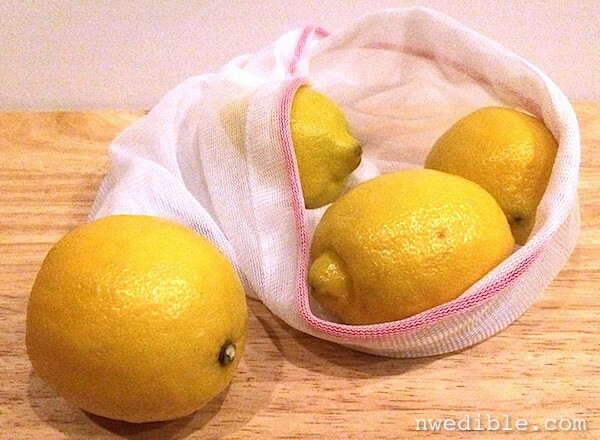 Place you lemons in a sling of several layers of cheesecloth or inside a reusable mesh produce bag (these are the kind I have). Tie the lemons inside the cheesecloth or mesh sling, and secure this sling to the outside of the jar with a length of kitchen twine. 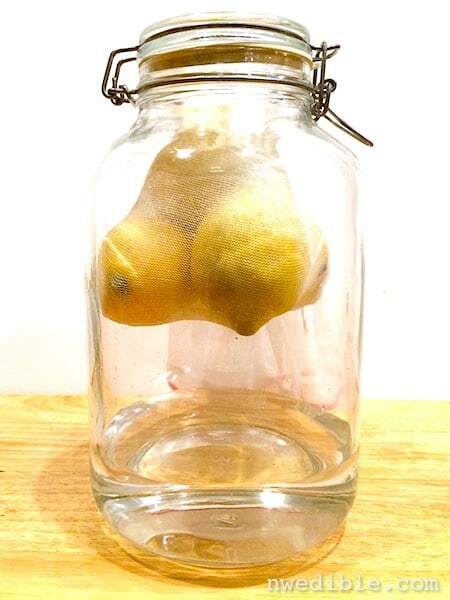 The idea here is to keep the lemons fully inside the jar, but suspended over the alcohol. Adjust the depth of your cheesecloth sling accordingly. Tightly lid your jar. You don’t want any of that vodka evaporating away. Store your jar in a dark, out-of-the-way place for at least three months, until the vodka in the bottom of the jar is a pale straw-yellow color. Try not to open up your jar for at least a few months. Basically, just leave it alone; nothing bad will happen if the infusion goes on a few weeks too long. When the infusion process is complete, the vodka will smell and taste strongly of lemons. and the lemons themselves will look pale and kinda grey, almost like vampire husks of their former selves. Remove the lemons and the cheesecloth sling. Combine the sugar, lemon zest and the freshly squeezed lemon juice in a small saucepan to make a lemon syrup. Bring to a simmer over medium heat, then stir to dissolve the sugar into the lemon juice. Remove the lemon syrup from the heat and set aside. When the lemon syrup cools to room temperature, strain it into the infused vodka. Discard the lemon peel. Stir the lemon syrup and infused vodka together. 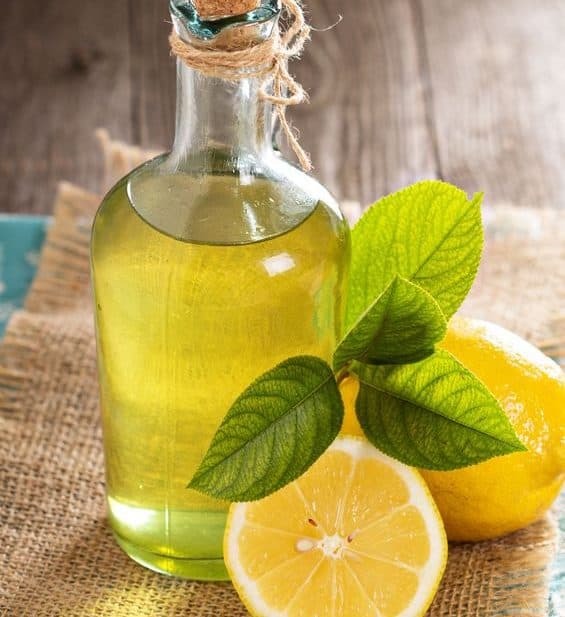 Transfer the limoncello to a clean, sanitized bottle with a tight-fitting lid. Store the limoncello in the freezer, where it will last indefinitely. What are your thoughts about the quality of vodka?? Nothing terrible – the bottom shelf stuff isn’t good for much but cleaning – but you don’t have to use the most expensive thing, either. Costco has a Kirkland Signature American Vodka sold as a 1.5 liter that is perfect for stuff like this – in our blind tastings it was just as tasty (or taste-free, cause, you know, vodka) as far more expensive brands like Chopin. The only vodka that beat out the Kirkland American in our tasting line-up was Ciroc, and it’s arguable if it’s even a vodka, or if it should be considered a brandy, since it’s distilled from grapes. If you aren’t a Costco member, Smirnoff Vodka is totally acceptable, too. Awesome – thanks for the follow-up! I’m going to try with Smirnoff and report back… in a few months. When maybe the polar vortex on the east coast has subsided. Not sure if this is a silly question, but because I hate to throw anything away, are the four initial lemons good for anything after their three months suspended over vodka in a jar in the closet? They really aren’t. They basically turn yellow-greyish and all the flavor goes into the vodka. I wish I had taken a picture of them on my first batch – they are really quite sad looking at the end. 1. So the lemons are suspended above the vodka, and nothing – not even the mesh bag, touches the liquid? 2. How exactly do you rig it up? Does the mesh bag stick out of the glass jar? If so, does that affect the seal? 3. Where do you but glass jars that size? 1. Correct. They are just suspended over the vodka, no touching. 2. I’ve done two ways: with cheesecloth tied with kitchen twine in a little bundle, and then tied off to the outside of the jar, and with the mesh bag pinched smoothly in the seal. My final yield was only slightly less than my starting yield, so if your jar is nearly airtight like a mason jar or a Fido glass jar with a fresh rubber gasket, I don’t think the seal is effected enough to matter. When I have a minute I’ll take a close up photo and update the post to make this more clear. Thank so much Erica! I appreciate all the great info. How fun! Do you recommend the regular Eureka type lemons or Meyer? Also, could this work with another citrus like limes , blood oranges or grapefruit? It’s getting toward the end of grapefruit season here in Texas, but there are still good looking fruit around. I’m thinking this could sit and age right next to the vanilla I made last month after reading your post. So many great ideas! Thanks for them all. I made the test batch with regular Eureka / Lisbon type and I’m doing a batch with meyers right now. The standard lemons turned out great – I’m a bit concerned the less pungent Meyer’s might actually not be as good in this situation. Will report back in about 2 months. 🙂 No personal experience with grapefruit or limes, but in theory they should work. You might have trouble getting whole grapefruit’s in the jar. And of course, you’d want to adjust quantities of citrus as needed. Nope, the vapor of the vodka infuses the lemons. It’s a no mold situation. That first picture is so pretty!! I love this! Great tutorial. I haven’t preserved any citrus yet this season, and now I’m kicking myself for it. Where do you like to buy yours? I used to find great deals at Lenny’s Produce in Greenwood, but we recently moved to White Center and I don’t have a new favorite place for affordable citrus in winter. Thanks! Thanks so much for this! I always wondered how to make Limoncello….one of my faves next to garlic and olive oil! the lemons could probably go thru the garbage disposal, maybe a little freshness left? Yum! Can this be stored at room temp? Once the limoncello is done, can I mail it as gifts, or will it spoil? Oh gosh. I started a batch of this limoncello last spring. And forgot about it. I just brought it up from the basement today. What the heck? Should I pour it out? Can it be saved? The lemons were just as you described. They were never touching the vodka. It doesn’t smell rotten… I’m pretty adventurous, but I don’t know if I am taking a ridiculous risk here. What do you think? It’s totally fine. Proceed, sip and enjoy! I’ve left mine for a year with the lemons before, too – the only thing in that jar is pure alcohol and citrus oil; both very effective at keeping nasty microbes at bay. Yay! So, it’s medicinal as well! ::wink:: I will carry on with the recipe (just bought two organic lemons) and toast your health when it’s done! If I use the cheese cloth method, can I hang the extra cheesecloth trendles outside the jar after I’ve tied off the sling with twine? I put the glass lid on over these cheese cloth trendles, and then taped the lid in place. It’s been two weeks and the alcohol is still clear and the lemons still look “fresh”. The alcohol level has not gone down, so I don’t think it’s evaporating out of the glass jar thru the cheese cloth trendles. What are your thoughts?